Don't waste food that's too salty, there's a quick fix! Rescue too-salty soups and sauces by adding a bit of water, sodium-free broth, or other liquid. Start with a small amount; then, taste the results; and add more until you get it right. You might need to add more solid foods to get the soup or sauce back to the desired consistency. To fix over-salted meats, just give them a quick rinse under running water, and pat them dry with a paper towel when you're done. You can also leach the salt out of salt pork or bacon that you find too salty by soaking it in water for at least two hours before you serve it. Use an acidic ingredient, like white vinegar or lemon juice, to cut the saltiness of soups and sauces. A splash should be all it takes to dial back the saltiness. Counteract all of that saltiness by stirring a pinch of sugar into soups, sauces or other liquids. Consider brown sugar for darker sauces. Transform too-salty tomato sauces into a tomato cream sauce by adding a splash of cream to dial back the saltiness. Toss in extra veggies, noodles, rice or other grains to bulk out a recipe, so it no longer tastes too salty to eat. You'll have extra food, but you won't be wasting money. Adding a single potato to a dish has long been touted as a way to remove excess salt. It may or may not work, and there is some debate in the cooking community about its effectiveness. However, the potato trick is worth trying if all else fails. Simply place a whole potato―skin and all―into your soup and cook as normal. Remove it before serving. It's always easier to prevent overly salty foods than it is to fix them. Keep these tips in mind when cooking, and you may be able to avoid a repeat of the problem in the future. Never measure salt (or any spice) directly over pots, pans or bowls that you're cooking in. If too much pours out, it'll end up in your food. Check the salt shaker lid every time! It's a good idea to make sure that the lid is tight before each use. Watch for ingredients that contain sodium. Many canned and commercial foods contain salt, so you may want to taste the dish before you add any salt that the recipe calls for. Under season while cooking, and perfect it at the end. 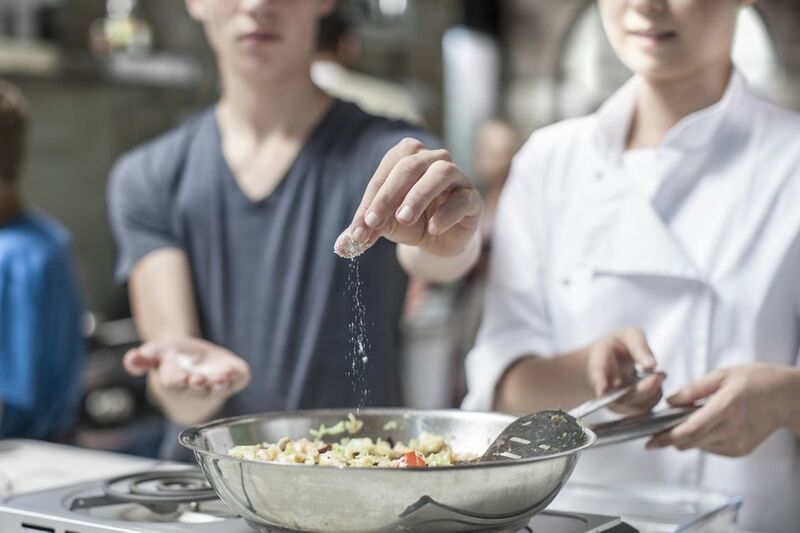 Good cooks quickly realize that it's best to add seasonings slowly. Salt intensifies in soups and other dishes as liquids cook off, so wait until the end to taste your dish and add any finishing touches. Taste, adjust; taste, adjust. It's perfectly fine to keep adjusting your recipe as it cooks. Stop adding salt. Doctors are constantly warning us to reduce the amount of salt we consume because we often unknowingly exceed the daily recommendation. Avoid adding salt while cooking and keep a shaker on the table. This will allow everyone to customize the dish to their tastes or dietary needs.